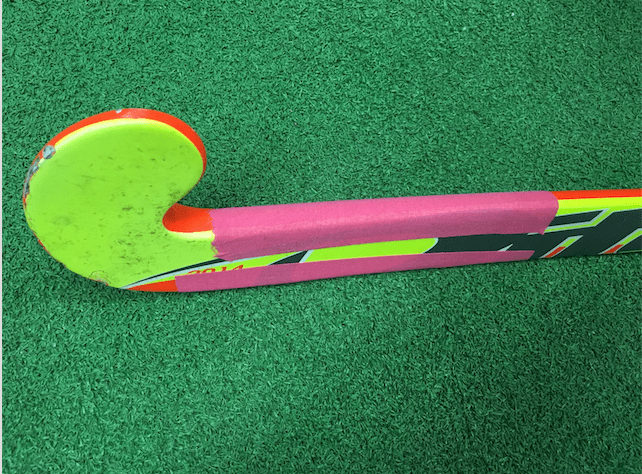 Taping your stick could prevent paint chips from hacking. This can be done in various methods using athletic tape. Athletic tape or hockey tape can be found in a variety of colors and widths. It’s sold at stores near the Band-Aids, at hockey events, or in sporting goods stores. The first method can be used to protect the stick, but still keep the weight of the head light and quick. Put one strip of tape on the bottom of the staff and one strip of tape on the top edge of the half. The strips should be 4” to 5” long. The image shows this method. The second method can be used to increase head weight and still protect your stick. Advanced players use the tape as a brake when making a stop. The friction of the cloth tape, when in contact with a spinning ball, slows or stops the spin and allows a more accurate hit. Depending on your stopping style, wrap from 4"-8" of the lower shaft. Start just above the head and wrap it around the stick completely at an angle similar to the grip.